STAT FLEX Enables on screen profiling timers and counters. See the stats section for more details. STAT FLEXGPU Enables the GPU kernel timers. This profiling mode is quite expensive, so it needs to first be enabled with “stat group enable Flexgpu”. Be sure to disable it with “stat group disable Flexgpu” before doing any whole-frame profiling. Solve Sync Time (CPU) This is the time the CPU spends waiting for the GPU to complete the simulation work. If this is high then it means the GPU is spending a long time in the simulation kernels, use “stat Flexgpu” to get more details on the GPU bottlenecks. Solver Tick Time (CPU) This is the CPU time it takes to launch all the Flex GPU work from the CPU. Update Actors Time (CPU) The CPU time to update all the FlexActors. This includes time to update actor bounds and process any particle updates from the simulation. Skin Mesh Time (CPU) Time spent on the render thread updating vertex buffers for clothing actors. Update Data Time (CPU) The time it takes to push any parameter or particle changes from the CPU to Flex. The largest cost in this is usually memory transfer overhead related to the number of particles in the container. Gather Collision Shapes Time (CPU) The CPU time spent gathering the collision shapes overlapping each FlexActor bounds. If it is high then it may mean there are too many collision shapes overlapping FlexActors, or simply too many actors. Update Collision Shapes Time (CPU) The CPU time spent updating collisions shapes. Container Count The number of active containers. Instance Count The number of actors using the container. 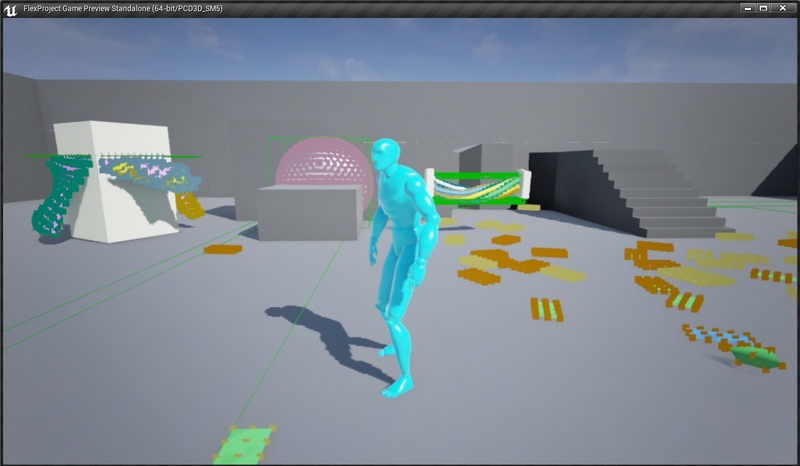 This includes static mesh actors, ropes, and particle components. Particle Count The total number of active particles in all containers. Spring Count The total number of active springs in all containers. Shape Count The total number of active shape constraints in all containers. Soft bodies will contribute multiple shapes, and rigid bodies just one. Collision Shape Count The total number of collision shapes being mirrored to the Flex solver. Collision Convex Mesh Count The total number of convex meshes being mirrored to the Flex solver. Collision Triangle Mesh Count The total number of triangle meshes being mirrored to the Flex solver. Force Field Count The total number of active force fields. Active Mesh Actor Count The total number of FlexActors active in the level. 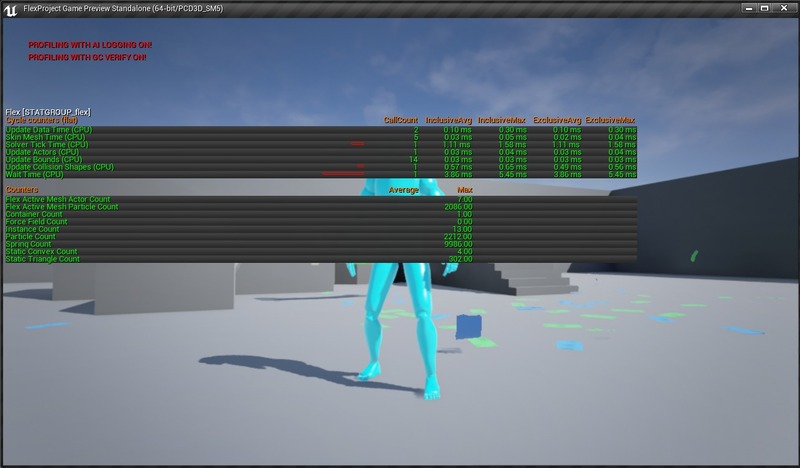 Active Mesh Particle Count The total number of particles belonging to FlexActors. It does not count the particles from emitters, ropes, etc.